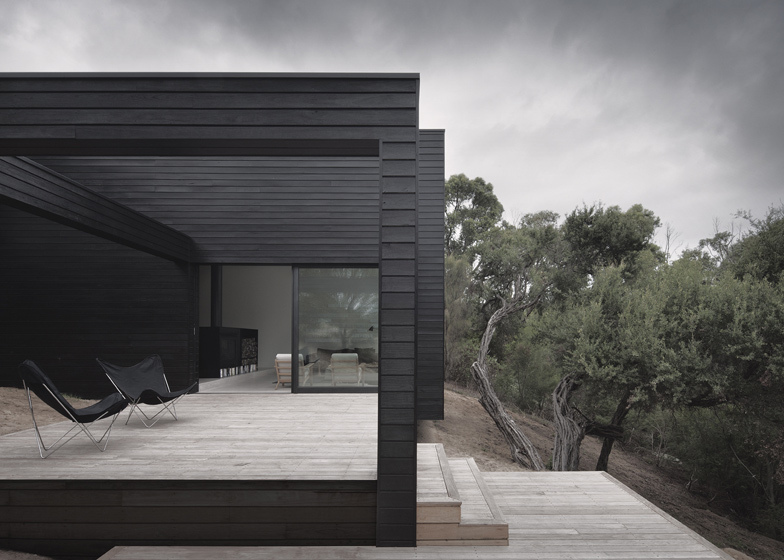 This rural residence outside Melbourne by architects Studio Four features a blackened timber exterior and terraces that step down a hill (+ slideshow). Ridge Road Residence is located in the grounds of a golf course on Mornington Peninsula and sits beside a tea tree on a gently sloping site. Studio Four rejected the raised podium approach adopted by other houses in the area and instead planned a building that staggers down on a series of split levels. The terraces sit at the lowest levels, surrounded by long grasses that protect them from the prevailing winds. An open-plan living and dining room opens out to one of the terraces, which is framed by a cube of timber columns and joists. 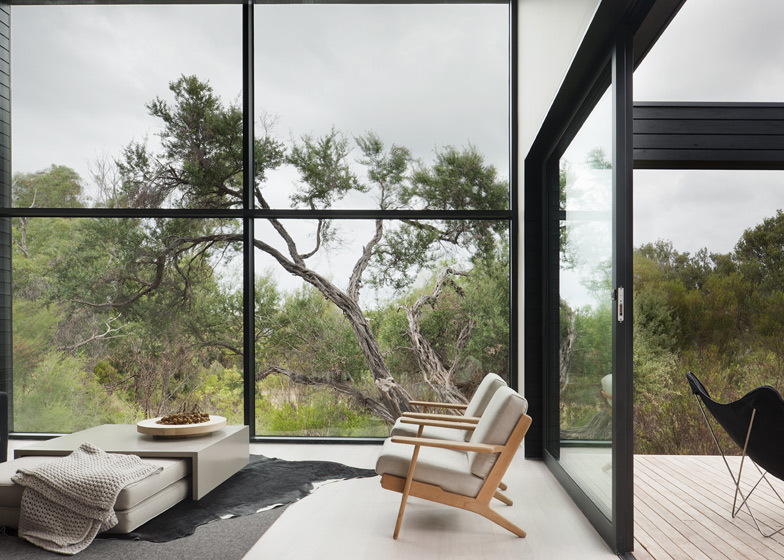 Inside this room, a double-height window stretches across the end wall to frame a view of the nearby tea tree. "We sought to create a quality of space that provides a sense of sanctuary, enclosure and comfort," say the architects. "Emphasis was placed upon capturing the varying qualities of light, the scale and proportions of space, and providing a tangible connection with the building's surrounds, both in topography and landscape." The kitchen runs along the rear of the living room, against a wall of matte black panels that conceal utility rooms. An ensuite bedroom is located just beyond and is raised up to become the uppermost level. 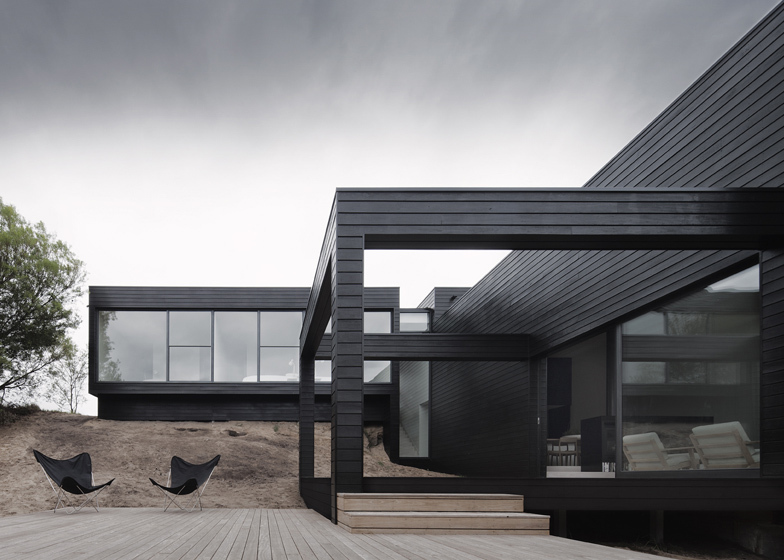 Black-stained timber clads the entire exterior, while each window has dark-tinted glass intended to reflect the surrounding landscape. "By using pared-back forms and detailing and a restrained palette of materials the emphasis becomes not on the insular and what has been 'designed in', but what nature has provided," add the architects. All windows are full height to maximise daylight into the house, while concrete floors and thick block walls help to hold in the heat. Other black houses we've featured recently include a weekend house in Chiba and a writer's hideaway in upstate New York. See all our stories about black houses. 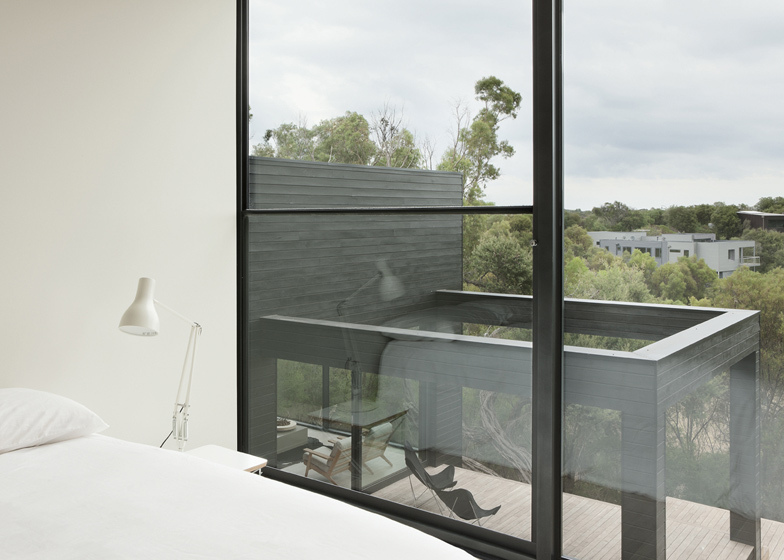 See more houses in Australia, including an isolated hilltop house with a dramatic cantilever. Photography is by Shannon McGrath. It is difficult to gain more than a glimpse of the dwelling through the surrounding vegetation. 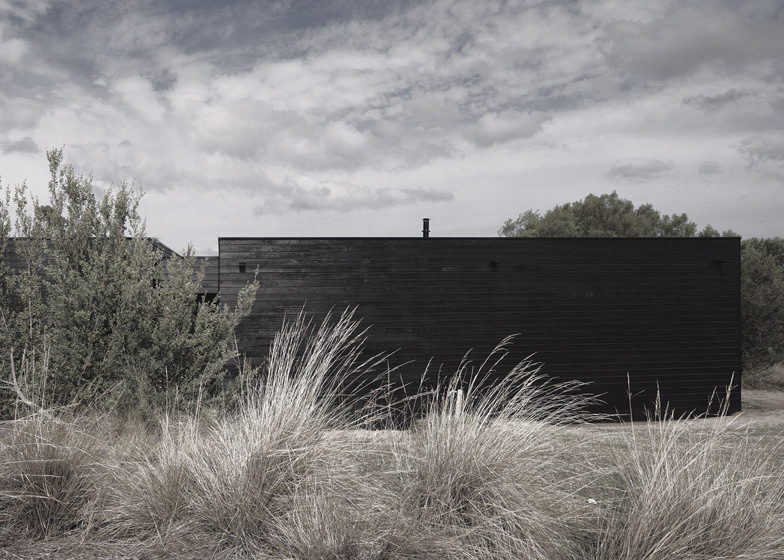 Where the house is visible, it blends within the landscape, the black timber cladding and dark reflective glass selected to help dematerialise the building form from its natural surrounds. The front elevation comprises solely of blackened timber walls, punctured only to signify the entry. From the street the scale of the house is deceptively modest, the second, lower level is non apparent. The building form sits low, within the existing native grasses, promoting opportunities to connect intimately with the landscape. The site for this new house is located within the Moonah Links golf course, on the Mornington Peninsula. A simple brief and program requirements, teamed with a dramatic site characterised by a steep slope and a single tea tree, enabled the design to become an exploration into enclosing the basic rituals of domestic life within restrained building forms, whilst at the same time exposing the building's program to varying levels of interaction with the surrounding landscape, both immediate and beyond. In stark contrast to the surrounding houses, which attempt to cancel out the sloping topography by creating a podium level at which the outdoor areas sit exposed high above ground level, the design for this house adopted a gentler strategy, with the building form spilling down the slope to terminate in a series of terraced decks. These low lying decks provide privacy from the golf course below, whilst the surrounding native landscape shelters the outdoor areas from harsh prevailing winds. Varying levels of interaction and connection with the landscape, both real and perceived, drove all aspects of the design, from the channelled views of the horizon upon entry, through to the double height picture window that captures the full proportion of the tea tree, and the direct and intimate connection provided by the low level decks. We sought to create a quality of space that provides a sense of sanctuary, enclosure and comfort. Emphasis was placed upon capturing the varying qualities of light, the scale and proportions of space, and providing a tangible connection with the building's surrounds, both in topography and landscape. Through the building's design, the client is able to experience many aspects of the surrounding landscape, whether it be a direct or perceived experience, whilst at the same time maintaining a high level of privacy from the golf course below. The form of the building was also driven by the desire to separate the public and private zones of the residence. The kitchen, dining and living spaces are combined to create a single, fluid area, delineated only by a gentle level change and a fireplace / storage element. These elements provide the level of intimacy required by the client whilst also allowing the advantages provided by open planning. The panelised matte black wall to the kitchen conceals a powder room, laundry and butler's pantry, providing the high level of functionality required, while maintaining the calm qualities of the open plan space. Our challenge was to demonstrate that a custom architectural solution could achieve our client's budget whilst responding directly to the essence of the site and its location. The house demonstrates that we could not only capture the sense of place, but we could also deliver a competitive cost effective solution. By using pared back forms and detailing and a restrained palette of materials the emphasis becomes not on the insular and what has been 'designed in', but what nature has provided and drawing this readily available 'genius loci' inside for all to experience. The design for this house stems from an exploration into the absence of what is not necessary, in both building form and detail, which is at the core of sustainable design. Renewable timber was selected as the primary building material. Used both internally and externally, its natural aesthetic properties are complemented by the low energy levels required in its production, which significantly reduce the environmental impact of the building. The design located the eastern end of the lower level below the natural ground line, with concrete slab flooring and block work walls providing a high thermal mass, to balance the large expanses of glazing to the north and west. The upper level is cantilevered, with the timber construction incorporating high levels of insulation throughout. 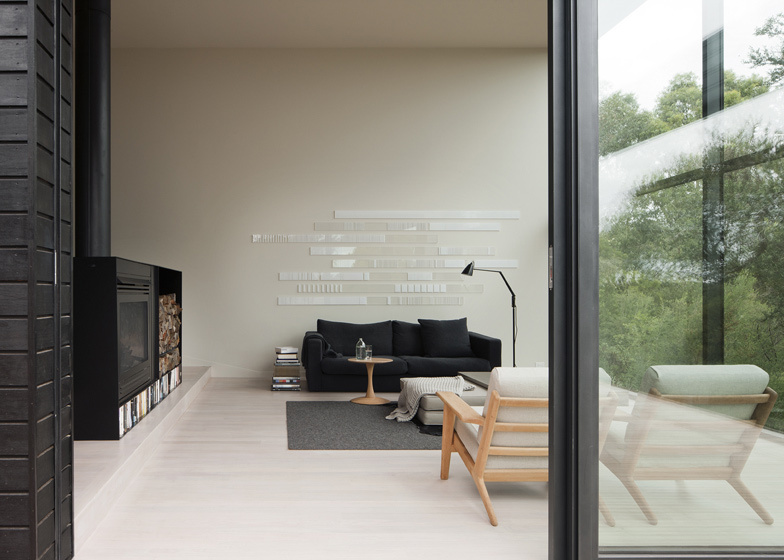 With views to the golf course to the west, all windows and glazed doors were double glazed with high performance glass, enabling a strong connection to the landscape without compromising the integrity of the building fabric. The existing tea tree became a critical element to the locations of windows, providing sun shading to the internal living areas. Access to daylight was maximised, with all windows full height, and predominantly openable to maximise natural ventilation throughout. These core sustainable design principles were teamed with underground water storage, water saving fixtures, low voc paints and materials, to complete the sustainable approach. Following completion of the house, the site is being re-vegetated with native species endemic to the local area.